do you think this could be related ? or possibly the permissions are wrong ? 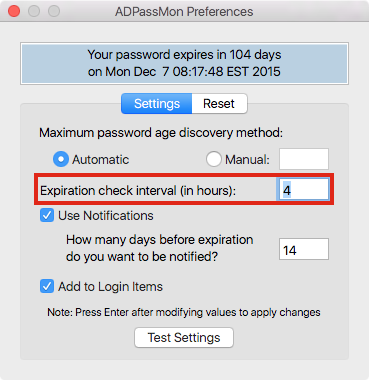 9/2/15 12:01:48.190 PM ADPassMon Password does expire. 9/2/15 12:01:58.764 PM ADPassMon Password does expire. I think this must be related to the LaunchAgent. Can you check to see which user owns the ADPassMon process on the affected computers? The “No user interaction allowed” error makes me think the process is owned by a process that’s not on /dev/console. Also, the permissions on the ADPassMonAppDelegate.scpt file are fine. It’s not an executable script. Good to know the permissions are correct, i just checked in Activity Monitor and the ADPassMon process is running with my name by it, i’ll see if i can find any more info on this.